The Space Weather Team at University of Rome Tor Vergata is developing instrumentation and algorithms with many application to Space Weather. The team builds upon the contributions of the Altea group, the Solar Physics group and the WiZard group. SPARC Space Awareness for Critical Infrastructure project has been financed by the EU HOME AFFAIRS CIPS programme and is devoted to the analysis of space phenomena, such as solar activity, space weather, debris and NEO which could pose a risk to critical infrastructures. SWERTO: Space-Weather at the University of Rome Tor Vergata has been financed by the Regione Lazio FILAS-RU-2014-1028 fund for the period April 2015 – March 2017 under the number 18466. The main goal of the project is the realization of a data-base centre for satellite-borne (e.g., PAMELA, ALTEA) or ground-based (e.g., IBIS, MOTH) instruments which are relevant to the determination of the physical conditions of the circumterrestrial environment in the Space-Weather perspective. IPS Ionospheric Prediction Service project has been financed by the European Commission through the Tender contract No: 434/PP/GRO/RCH/15/8381. UTOV contribution to the IPS project is represented by four main pillars: 1) observations and algorithms for flare forecasting, 2) research on magnetic reconnection as trigger of flares and CMEs, 3) algorithms for the detection of CME onset and time of arrival at 1AU, and 4) measurements of SEP and GCR and related research activities. PAMELA could be considered as the greatest effort of the WiZARD Collaboration which, starting almost 30 years ago with the New Mexico State University group led by the late Robert L. Golden, has successfully built and flown several balloon-borne experiments (MASS, CAPRICE, NINA etc) giving relevant contribution to a deeper understanding of numerous aspects concerning cosmic ray physics. PAMELA (Payload for Antimatter Matter Exploration and Light-nuclei Astrophysics) space experiment was launched in 2006 June 15th and placed in a quasi-polar circular 70° inclination orbit. 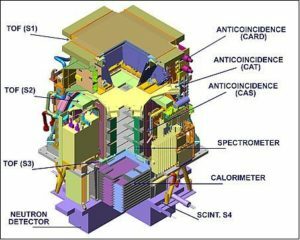 It is a powerful particle identifier using a permanent magnet spectrometer with a variety of specialized detectors for cosmic ray direct measurements in space with high precision. PAMEA orbit is particularly well-suited to observe the arrival of energetic particles coming from the Sun (SEP), especially during its polar passes where the geomagnetic cutoff is low enough to not deflect them. PAMELA can measure indirectly the effect of the incoming Coronal Mass Ejections (CME) by the changes in the galactic cosmic ray spectrum due to the plasma bubble cleaning up the regions around the Earth (Forbush decrease) and shielding the arrival of the galactic component. PAMELA can also fill the gap in energy between the in situ observations (a few keV) and the ground-based observation by the Neutron Monitors network (> 1 GeV). PAMELA can measure the incident trajectory of the detected particles employing a combination of trajectory reconstruction with the silicon tracking system and particle tracing techniques. Even its field of view is narrow (∼20°) it is a moving platform, so it is able to sweep through pitch angle space allowing one to construct a pitch angle distribution of the SEP.